Summit Martial Arts was voted 2017, 2018 and 2019 Top Martial Arts School in Calgary, We are home to the 2016 W.O.M.A.A. World Martial Arts Games Silver Medalist for Sparring, the 2014 TAFISA World Martial Arts Games Champions and was named 2014 Top Martial Arts School for Kids in Calgary by Chatterbox. We are proud to offer martial arts classes for ages 5 through adult, beginner to advanced black belt. We pride ourselves on maintaining a high standard of learning for all our students. We adhere to the traditional methods of training - our classes will challenge your mind and your body. Our students feel satisfaction and pride knowing they have EARNED their belts. Students will be expected to uphold the tenets of Tae Kwon Do : Courtesy, Integrity, Perseverance, Self Control and Indomitable spirit both inside and outside the dojang. Involved instructors - we won't ask you to do anything we won't do ourselves. You kick, we kick! Instructors are lifelong students - keeping up their skills and learning new techniques. We believe the journey is not over when you get your black belt, it is just beginning. 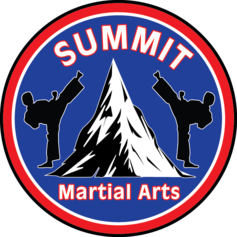 Are you the owner of Summit Martial Arts?